"We are all doing the best we can with what [beliefs] we have." Boom! There went the "blame game". Guilt? Gone. Wow! 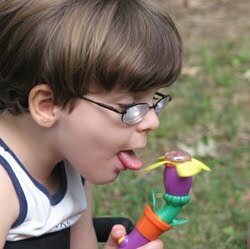 My son, Eidan (ay-den), was doing the best he could with autism and other issues. Ahhhhhh. No more would I think that he wasn't trying. (Now, two years later, it's mind-boggling to me that I ever held that belief.) I felt so relieved. The belief that we're all doing our best gave me the ground on which I could give myself forgiveness for doing anger with my adorable children and equally adorable wife. It opened my eyes to loving other people that I judged. My vision of my childhood underwent a re-vision. Suddenly, I was changed. "All are nothing but flowers in a flowering universe." Looking for and noticing the beauty in others, especially in their characteristics that may, at first, seem "weird" or "different" is a means to flow with and grow with the attitude of love and acceptance we use as Option Process mentors and working with children in Son-Rise Programs. Imagine yourself with the ability to love anything and go for it! Love it! The only thing that might be "different" is you.